The Stars and the Location create the Magic. If you are interested in the Beginners Guide to Stargazing course, please see our Contact page. Then give us a call and have a chat to find out what the course is all about. The first half will be our AGM - The rest of the meeting will be to support the Stargazing course members with any questions they have or help they need. This meeting will be to support the Stargazing course members with any questions they have or help they need. See our Location Page for a detailed map of how to find us. !! - Only £20 for all 6 evenings - !! please see our Contact page for telephone booking numbers. What people say about the course. "I have learnt so much more on these courses than I could ever learn by reading books as I prefer the visual side of learning which I can now use by reading the books and learning more. Thank you!" : Sid. "I have thoroughly enjoyed all 4 courses. I knew nothing before I started and now know enough to get me started and continue searching the night sky. Thanks for setting up Thanet Astronomy Group!" : Rita. The Beginners Guide to Stargazing Course is designed to give you the knowledge you need to become a confident stargazer. West Bay Cafe, Sea Road, Westgate-on-Sea, CT8 8QA. EVERY Saturday afternoon between 1pm and 4pm. If the weather is bad you may find us inside the Cafe but if the Sun decides to shine, we will have our telescopes set up, hopefully observing sunspots, but also looking out at sea at the windfarm, the pier head at Herne Bay, and if it is very clear the World War 2 sea forts, the Isle of Sheppey and the Isle of Grain may be visible. In the meantime why not look at our monthly newsletters. Also, we have found some interesting news articles for you to have a look at. 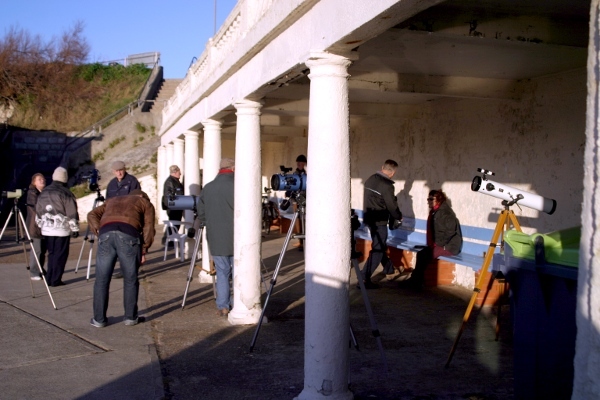 To become a member of the Thanet Astronomy Group See the Members page. All the details you need are there including a download link for a copy of our constitution and the membership application form. JAC & GILL Club First Meeting West Bay Cafe Sat 11 04 2014. 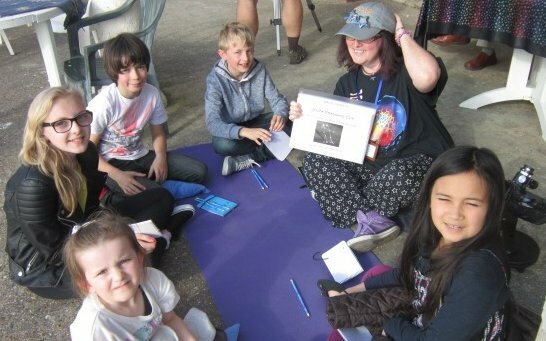 Following the runaway success of the main Thanet Astronomy Group, we now have many families with children that are also very interested in astronomy. Therefore, we have set up the JAC & Gill club for our younger (5 to 17 years) enthusiasts. The JAC & Gill Club meet every Saturday 3:00pm to 4:00pm at the West Bay Cafe during the Free adults meeting. For more information see the JAC & Gill Club page. Email your comments to us, the email address in on the contacts page. We have added a page to the site so you can put short comments about what's happening at Thanet Astronomy Group. To help give people a better idea of what we do. If you have a comment you would like to add then let us know. Awesome...Thank you so much! Looking forward to putting it all into practice with the Brownies! Thanet Astronomy Group holds a FREE daytime public meeting. Every Saturday come rain or sunshine. It is a drop in meeting between 1-4pm. The West Bay Cafe, Sea Road, Westgate-on-Sea, Kent. CT8 8QA. If the weather is good we will be outside the cafe with several telescopes talking to people about astronomy. If the weather is bad then we will be inside the cafe talking to people about astronomy. First :- This meeting is to enable people that are new to Stargazing or Astronomy to have a friendly informal chat to their local astronomy group. Second :- We have found that if you want to learn how to use a telescope it's a lot easer if you can see what you are doing in daylight rather than in the dark. Third :- Some people ask how can you do astronomy in the day ? Then we show them the Sun, Sun Spots, The Moon and even look at the planet Venus. There are also many other things to look at, the wind farm, WW2 sea forts, Ships, Wild life, Cormorants fishing and then sunning to dry their wings. Meeting at the West Bay Cafe - Sat 11 01 2014. We are an astronomy group that is intended for people at all levels of astronomy. We especially welcome people new to the subject. 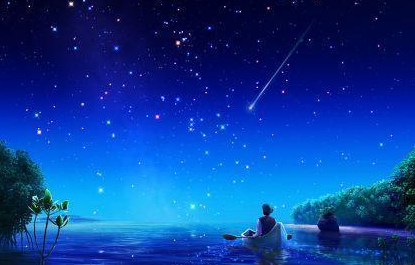 All you need is an interest in the stars above. If you want to learn about astronomy then this meeting is for you. We are trying to set up a small library of Astronomy books. If you would like to help with this project or have any Astronomy books you would like to donate please contact us. Click here to see details of our list of available presentations about astronomy. We have presentations on the History of Astronomy, Jupiter and its Moons, The Planets, The Moon, and Asteroide 2012 DA14. West Bay Cafe, Sea Road, Westgate-on-Sea, Kent. CT8 8QA.